Did you know 1.7 million children in developing nations will die this year because they don’t have access to life-saving vaccines? How can this be changed, you ask? Lives can be saved by simply administering vaccines to children who are most vulnerable to life-threatening diseases like malaria, pneumonia, diarrhea, and polio. It’s that easy. I am happy to announce that we have partnered with Shot at Life, a United Nations Foundation campaign that educates, connects and empowers Americans to champion vaccines as one of the most cost-effective ways to save the lives of children in developing countries. Read an interview with Peg Willingham, Shot at Life’s Executive Director. 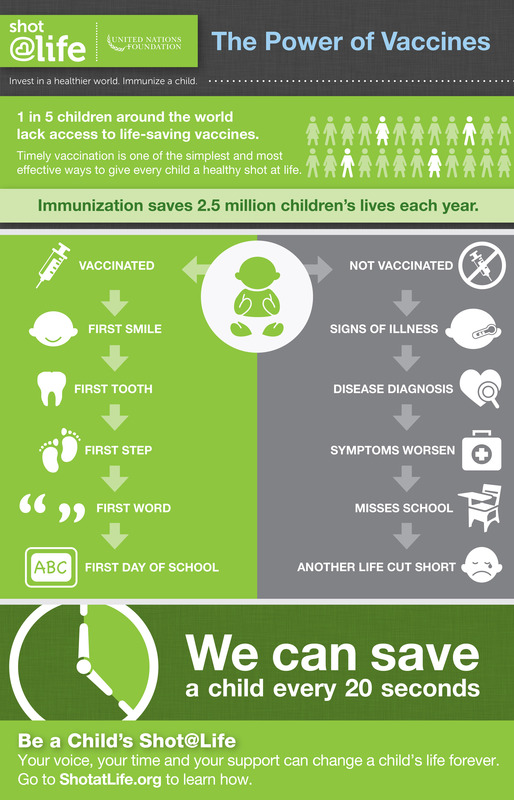 A national call to action for this global cause, the campaign rallies the American public, members of Congress, and civil society partners around the fact that together, we can save a child’s life every 20 seconds by expanding access to vaccines. By encouraging Americans to learn about, advocate for, and donate vaccines, the United Nations Foundation’s Shot@Life campaign will decrease vaccine-preventable childhood deaths and give children a shot at a healthy life. To learn more, go to ShotatLife.org. Like Shot at Life on Facebook and follow them on Twitter. I was just invited to a local event for this organization and was Googling around to see what I could learn about them. What a (should I say another?) great partner Jennifer!